A comprehensive, authoritative and up-to-date reference for the newcomer to radiopharmaceuticals and those already in the field. Radiopharmaceuticals are used to detect and characterise disease processes, or normal biological function, in living cells, animals or humans. Used as tracer molecules, they map the distribution, uptake and metabolism of the molecule in clinical studies, basic research or applied research. radiopharmaceutical imaging to evaluate products. Michael J. Welch is the editor of Handbook of Radiopharmaceuticals: Radiochemistry and Applications , published by Wiley. 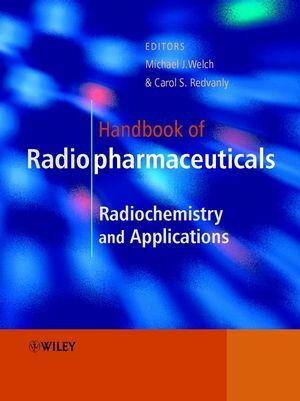 Carol S. Redvanly is the editor of Handbook of Radiopharmaceuticals: Radiochemistry and Applications , published by Wiley. Production of Radionuclides in Accelerators (Schlyer). Accelerators available for Isotope Production (Ruth). Reactor Production of Radionuclides (Mausner and Mirzadeh). Chemistry of Nitrogen-13 and Oxygen-15 (Clark and Aigbirhio). Aspects of the Synthesis of 11C-Labelled Compounds (Antoni et al). Chemistry of Fluorine-18 Radiopharmaceuticals (Snyder and Kilbourn). Production and Application of Synthetic Precursors Labeled with Carbon-11 and Fluorine-18 (Ferrieri). Automation for the Synthesis and Application of PET Radiopharmaceuticals (Alexoff). Design and Synthesis of 2-Deoxy-2-[18F]Fluoro-D-Glucose (18FDG) (Fowler and Ido). Technetium Radiopharmaceuticals (Mahmood and Jones). Chemistry of Gallium and Indium Radiopharmaceuticals (Weiner and Thakur). Chemistry of Copper Radionuclides and Radiopharmaceutical Products (Anderson et al). Chemistry applied to Iodine Radionuclides (Finn). Radiobromine for Imaging and Therapy (Rowland et al). Development of Radiolabeled Probes to monitor Gene Therapy (Shiue and Eck). Mechanisms of Target Specific Uptake using Examples of Muscarinic Receptor Binding Radiotracers (Eckelman). Strategies for quantifying PET Imaging Data from Tracer Studies of Brain Receptors and Enzymes (Logan). Radiopharmaceuticals for studying the Heart (Hwang and Bergmann). PET Imaging Studies in Drug Abuse Research (Fowler et al). Research and Clinical Application of Neuroreceptor Imaging (Wagner and Szabo). Dynamic Neurotransmitter Interactions measured with PET (Schiffer and Dewey). Tumor Imaging (Hustinx and Alavi). Radiolabeled Peptides for Tumor Imaging (Knight). Radiolabeled Anitbodies for Tumor Imaging and Therapy (Zalutsky and Lewis). Receptor Imaging of Tumors (Non-peptide) (Katzenellenbogen). Pulmonary Function Imaging with PET Radiopharmaceuticals (Elsinga and Vaalburg). Considerations in the Selection of Radionuclides for Cancer Therapy (Kassis and Adelstein). Radiopharmaceuticals for the Study of Liver and Renal Function (Vera et al).